PHUKET: -- Phuket Prison is to be awarded “White Prison” status after regular inspections of the provincial detention facility declared it free from drugs and illegal mobile phones. 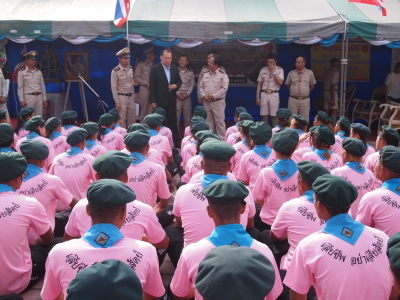 Department of Corrections Deputy Director General (Administration) Somsak Rangsiyopas announced the news at Phuket Prison yesterday at the opening ceremony of a scout training program for young inmates. “We have had many inspections for drugs and mobile phones smuggled into the prison and all results have been negative. Phuket Provincial Prison will soon be awarded White Prison status in order to reward the good work on the total ban of drugs and mobile phones coming into the prison,” Mr Somsak said. Mr Somsak also explained that the objective of the scout training for young inmates was to rehabilitate young offenders and change their daily behavior. “We want these individuals to see themselves as being valuable, have responsibility and be able to integrate with other people,” Mr Somsak said. “We also hope that those who have a history of using drugs will apply the scout rule in their daily lives. We want them to gain an inner strength,” he said. “Phuket has held scout training twice with 35 youngsters attending each training session. We have found that young offenders who passed the training can integrate well when living with others,” Mr Somsak added. Excellent idea - and I do wish them well.